Browser Tab Labeling Best Practices? Are there any Best Practices for Browser Tab labeling? 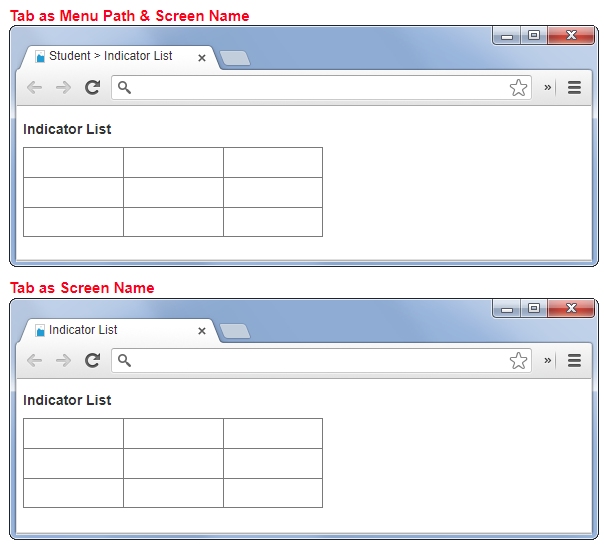 In our software, for a user to get to a screen they: Open a Menu then pick a Module, for example "Student". Under the Student Module there maybe multiple screens they can pick from such as "Student List", "Indicator List", or "Activity List". Would it be best to show the Menu Path in the Browser Tab after a user selects a screen or just the name of the screen they selected? Go with a short label. Browser tabs can get very small on lower resolution screens, small windows or when the user has a lot of tabs open at the same time. Be consistent also. Users click a menu item and expect to go to that page. Put that title as tab label. Users will have an easier time recognising the page they're at. Put the most unique piece of information in the beginning of the label. That way you'll get the best of two worlds. The specific view is easier to identify and you give more context for users with more available space. Not the answer you're looking for? Browse other questions tagged user-expectation labels best-practice browser . Can web analytic tools track user's behavior across tabs? Are there Android design conventions for an empty screen? Use labels/text under icons in the iOS tab bar? Plural or Singular Navigational Menu Options?